You know how there are certain cars that you always see at track days? Those favourite rides that just seem to be the most popular choices? 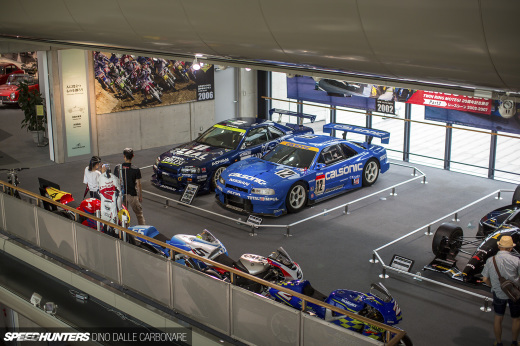 In Japan that’s any of the Skyline GT-R or Silvia generations, RX-7s, Evos and WRXs, and of course Civics and Roadsters. On the import side of things, it’s common to find BMW M3s of all ages at places like Fuji Speedway or Tsukuba, and believe it or not, Alfa Romeos are quite popular for the braver enthusiasts too. But Audis? Not so much – let alone a TT. So, when I saw this particular TTS looking track-tuned in the Fuji Short Course pit at The Check Shop’s Track & Show event last weekend, I knew I had to share it with you guys in a Spotlight feature. Although it was parked up next to an expensive and powerful TT RS variant, this car grabbed all my attention for the simple fact that it was modified everywhere – starting in the engine bay. The 2.0-litre direct injected and turbocharged four-banger – which is also used in the Golf R – has been treated to a number of obvious JDM touches, including a custom induction pipe fitted with an HKS Super Power Flow filter. 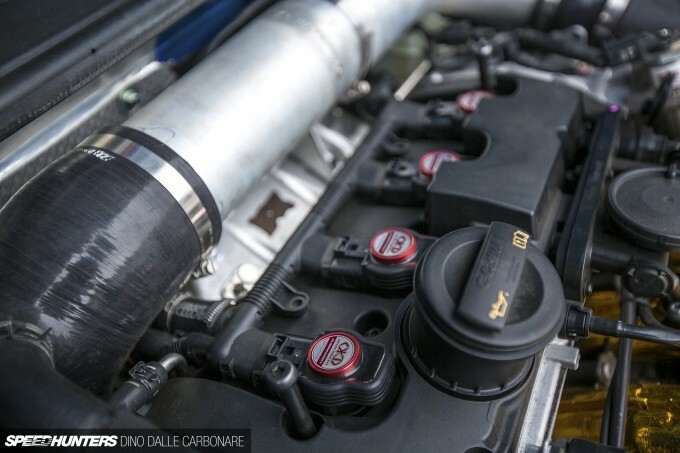 A set of Okada ignition coils guarantee a stronger spark and it’s fair to assume that a few more horses are being generated over the stock 268hp output. The interior had the back seat removed so that the rear strut tower bar could be used as anchor points for the Takata belts that are fitted to the curiously coloured seats. The quad-exit exhaust gives a nice deep tone to the boosted four cylinder, and by the way the TTS seemed to shoot out of the corners there was definitely no shortage of response. Serious investment has been put into the handling with a decent set of coilovers seen peeking out from behind the massive discs of the Endless 6-pot monoblock brake kit. Forged RAYS VR.G2s in an 18-inch fitment are used at each corner with Yokohama Advan A050 semi slicks providing the grip. Judging by the parts he’s picked, there’s no doubt the owner of this car takes his time attacking very seriously! The Japanese-style infusion that the car has been given makes this one of the nicest TTs I’ve ever come across in this country, which like I mentioned earlier, isn’t that many at all. This is a nicely detailed build, really brings out the muscly bulldogish lines of the TT which aren't readily apparent in stock form. Cheers Dino! Well done, definitely a great way to bring out some aggressiveness out of a TT. @Lebowski Fully agree. Well put. And what I wouldnt give for that BBK! Hnnng!! Such an underloved car, the TT. I feel like only recently are most people beginning to realize how brilliantly designed they are. In a few years people will start to appreciate just how classic this car looks. These cars seem so well put together. Not sure why they are rarely modified. 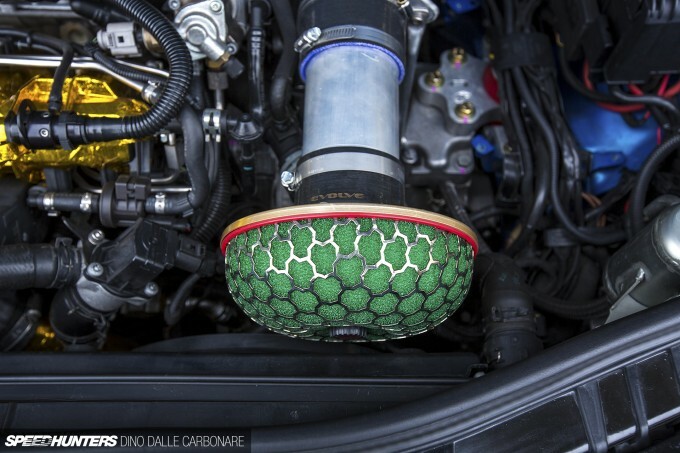 What's on the intake manifold? Gold tape or just paint? @Frank KootenayDub Correct. Gold is used to absorb the heat. The McLaren F1 had the whole under side of the engine compartment cover lined with it. I had a MK1 TT setup for fast road/ track and it was fantastic, got the same reaction too as it takes some imagination to take on a 'hairdressers car' however it was very capable and a fun all rounder, especially in the snow. NYporkdept Maybe, but essentially they're a golf. got any more details on the engine specs ? Must be quite a beast. Maybe a half roll cage behind the curiously coloured seats? LOL. Definitely points for uniqueness. Looks really rad to, those wheels give it purpose and aggression. Also used wrong( dont know what is the reason behind as thisis turbo car), that is not the intake manifold its the exhaust one... maybe some bling bling, or heat issues ,or egr overheating!? You are speedhunter´s readers so please.. some respect and dont comment for something that you have no clue what so ever..
BTW im not a audi fan boy or engineer, i study geography. romanrobbert scibO VW (and Audi) engines have their intake manis at the front and the exhaust against the firewall. Also, intake temp on a turbo car with a good intercooler can often be not far above ambient. With meth injection, it can even be below ambient. Either way, it's certainly way under engine bay ambient. ChristopherAnderson1 So true, so obvious.. now that i look at the intake sistem and the egr pipe´s route, and my apologies for the urangutan comments!! Might that be there to pretect from egr cooler, as the pipes from the intercooler are also rapped in gold, lots of trouble when u can simply eliminate the entire sistem, and save yourself with a lot off turbo headache. are direct drive to the front wheels and clutched to the rears . Heaven forbid someone likes their car and wants to drive it as hard as they can. KootenayDub It's metallized polyamide, and comes in sheets with adhesive on it. It's not very expensive (about $15 per square foot), as the metallized coating thickness is very thin. 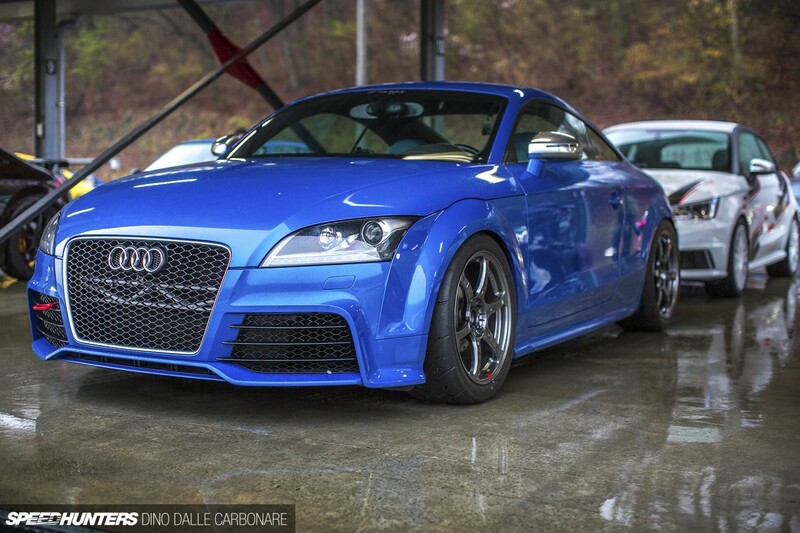 This car has installed the first APR Stage 3 kit for AUDI TTS of the world's in 2009. Cool that the owner has gone to the effort of using gold foil, but I do find it strange that they then don't have an enclosed air filter, so it's breathing hot air from the engine bay! Overall a very nice car, I'd not change much if it was mine apart from the seats... Brakes and suspension make up for them though! Completely wrong. That's an awd car, plenty capable on the track. And I'd hardly say an 11 sec car is a turd. But try on hating.